One thing you’ve noticed about this site is that I promote anything my friends are currently involved in. It doesn”t matter if it’s cycling-related or not, our lives are usually multi-faceted. Whether you’re a graphic designer, architect, fashion designer, dj, whatever, I’ll always promote what my boys and girls are passionate about. 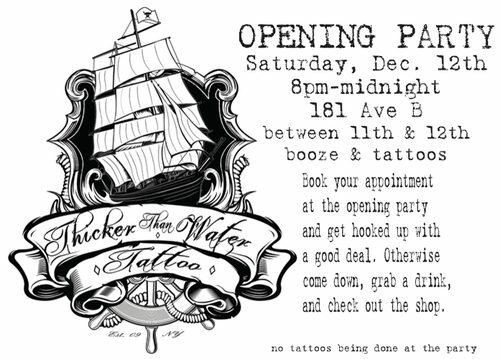 Nate recently invested all of his time and money into opening a tattoo shop in the East Village. Since moving here over a year ago, Nate has been struggling to find his niche in the Rotten Apple. When he first told me he was going to open a tattoo shop in NYC I was skeptical. It’s a lot of work to start your own business in the city. A few weeks later, he’s got a space, a shop design and a handful of talented artists. Shortly afterwards he had a name, Thicker Than Water. The shop is finished and it’s time to have an proper kick-off. Help Nate and the gang celebrate their love and head to the opening party. If you book an appointment at the party, you’ll get a special rate. If not, just come and hang out. Big ups to the crew over there and Nate, I’m beyond stoked for you man. Congrats! Follow Thicker Than Water on Facebook!